If you’re not reading Thor, God of Thunder then you’re not reading the best title Marvel’s currently publishing (with apologies to Mark Waid and his excellent Daredevil series). To be sure, Thor sucked me in immediately because it takes place in three different time periods, but it’s got more going for it than that. The premise is that an alien, Gorr, has decided to kill all the gods in all of the universe, earning the title “The God Butcher”. In the 10th century, Thor encounters him on Earth and manages to fight him off after being tortured by him. In the 21st century, Thor learns of him again and tries to hunt him down by researching other gods throughout the cosmos. And in the far future, Thor is the last survivor – and king – of Asgard, besieged by the God Butcher’s forces. This issue is the middle of the series’ second 5-issue arc, “Godbomb”, in which Gorr in the future is building a bomb which will kill all gods. 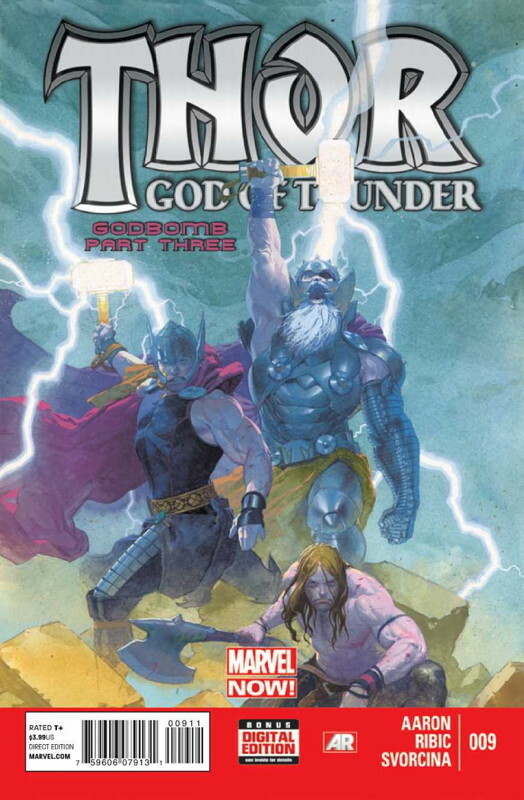 Through various machinations, the Thors of the past and present have ended up in the future, and the three Thors launch an assault on Gorr to stop his plan. This issue is essentially a big fight between Gorr and the Thors, and it’s quite well done. As it’s not the conclusion of the story, you can probably guess at the end of the issue, but it’s a good ride. Jason Aaron (who wrote the great series Scalped for Vertigo) has been writing for Marvel for a while, but I haven’t read any of his titles. He knocks it out of the park in this series, raising questions about what purpose gods serve, the nature of an entity who can kill all gods, and where both sides fall on the moral spectrum. He also does a good (though not terribly nuanced) job of distinguishing between the brash young Thor, the professional modern Thor, and the world-weary future Thor. Artist Esad Ribic does a great job with the figures, but is light on the backgrounds (conveniently, most of this issue takes place in space). No artist that skimps on backgrounds ever achieves top-tier status in my book, but Ribic is good overall. Thor consistently ends up on top of my to-read stack each week, and will as long as Aaron can maintain this level of storytelling. It’s been two-and-a-half years since the last issue of Astro City (the Silver Agent two-parter), but it’s back with a new ongoing series. While one always wonders if they’ll rattle off another 12 or 14 issues and then go on hiatus for a couple more years, I’m willing to give them plenty of leeway since Astro City is to my mind the best superhero comic of the last 20 years (and it’s not even close). This first issue of this new series feels like it’s trying to be a new phase in the comic’s history. Not only has the biggest mystery of past issues been solved (what happened to the Silver Agent? ), but it kicks off with a mysterious character named the Broken man, a conspiracy theorist with purple skin and white hair, who spends the issue talking directly to the reader (or so it seems). He takes on a brief tour of the city, focusing on a giant door which materializes over the river. He also suggests that a shadow entity he calls the Oubor is behind, well, something going on in the city. The Broken Man is clearly a few guppies short of an aquarium, and who he is, what he’s doing, and how much of the truth he’s telling (if even he knows) is clearly going to be a component of this new series. One of the neat things about Astro City has been that the “present day” tracks along in real time, so the earliest issues of the series occurred in the mid-to-late 90s, and this issue takes place in 2013. This means that some heroes have dropped off the grid, some have gotten older, and a few – like the Samaritan and Winged Victory – don’t seem to have aged at all. But we’re also reintroduced with Ben Pulliam, who was the main character in an earlier issue of the series, having just moved to the city with his two daughters. He’s older now, and his daughters are adults, and his mid-life crisis is a component of the story. I’ve always characterized Astro City as basically being about what people living in a world with superheroes think about that, and how they react to it. And “people” in this case includes the heroes and villains. I suspect Busiek feels he’s writing about people living their lives in this world, but at its best I think the book is about how their lives are different from ours because of these changes. Sometimes they’re extraordinarily different, and sometimes they’re not (one could argue that The Samaritan is just an exotic sort of workaholic, for example). 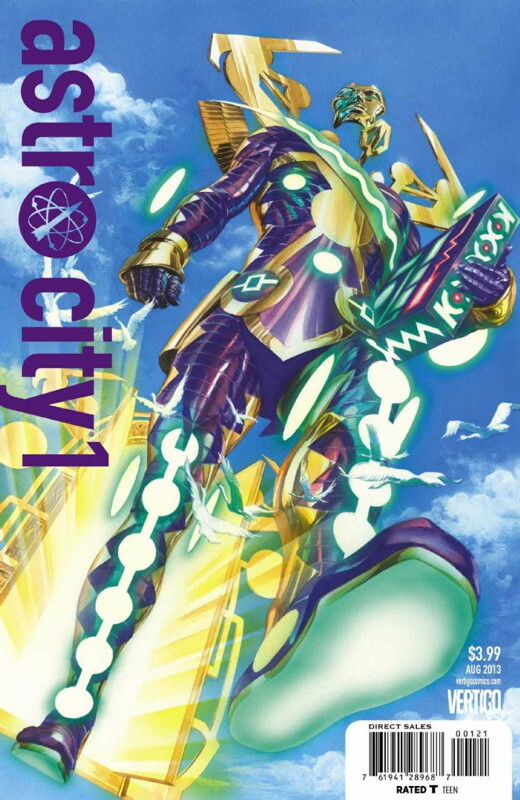 Astro City has a quixotic history (in my opinion) with mixing the cosmic and the mundane; the characters’ thoughts and reactions get lost amidst their actions – this was a problem I had with The Dark Age (which I reviewed in depth here). This issue takes a fairly cosmic turn towards the end, so I have a little trepidation regarding where the story is going. But overall Astro City (and Busiek as a writer generally) has such a strong track record that I’m willing to give it a lot of leeway. Brent Anderson is one of the most underrated artists in comics, able to bring life to Busiek’s world, as well as character and setting designs by Busiek, Alex Ross, and himself. Occasionally his characters are not the most expressive (he does stern and sad expressions better than, say, joy or surprise), but that’s a nitpick. Overall I’m just delighted that the series is back, and that they have almost a year’s worth of issues in the can. It should be fun. Friday night I played poker. I didn’t win, indeed I lost rather spectacularly. That aside, I had a good time. I also learned that I can no longer pass for thirtysomething in the eyes of twentysomethings. Saturday we got up early to clean the library for the arrival of our new daybed. The delivery truck showed up 35 minutes early (!!) so we had to scramble to clear and vacuum the room. Aside from the scramble, it was nice to get it done early. Roulette scratched up my right arm pretty good when I caught her to put her in a bedroom during the delivery. I spent 2 hours at the barber shop waiting to get my hair cut. The line was just as long when I left as when I arrived, so I don’t think I would have fared better had I come in later. Debbi vacuumed all the things while I was away. Went to Ikea to buy some more shelving for our master closet, which I then assembled. Between this and the daybed I think this was the most exciting weekend the kittens have ever had. Went to dinner at Su Hong in Palo Alto. Before dinner we put my old papasan – which has been replaced by the daybed – on the curb for free. It was gone when we came back. Visited with our neighbors across the street for about an hour. Spent the evening sitting on the porch reading and listening to the Giants game. Sunday we changed the sheets on our bed. I finished changing all the cat litter in the house. Opened some Magic card packs and catalogued them. Went to our neighborhood’s annual block party, where we ate lunch and chatted with folks. Spent a bunch of time trying to figure out why our steam cleaner wasn’t spraying any water. Finally got it working – though I’m not sure how – and cleaned two areas rugs downstairs. Then I went up to clean the guest room carpet and it wasn’t working again. Grr. Steam cleaning is not a big deal unless your steam cleaner stops working. Grilled chicken & peppers for dinner. Debbi made a tomato-and-mozzarella-ball salad. Trimmed the juniper around the edges of our back yard. Let Newton walk around the yard while I was doing so, which is his favoritest thing in the world these days. Worked on some comic book journal entries. This morning I arranged the roses I bought yesterday at the grocery store and forgot about until I was going to bed. And then I went to work and watched the WWDC keynote. I’ve been wanting to get back to writing weekly entries on comics again. This time around I’m going to focus on one comic per week. To start it off I’ll touch on a great comic that came out each of the last two weeks, and luckily for me there were two great comics for me to write about. There are a couple of behind-the-scenes stories surrounding Deathmatch. First is writer Paul Jenkins’ statement on why he left writing for DC and Marvel – he’s now exclusively at Boom. Second is that Boom, like IDW, seems to be making a play to become one of the larger publishers, though in its case it seems to be angling to become more like Image (superheroes and science fiction), while IDW is taking the Dark Horse avenue (licensed titles and adventure books). One wonders whether what attracted Jenkins to Boom will stay in place as (and if) the company gets bigger and more prominent. In the foreground, however, we have Deathmatch, which is Jenkins creating a superhero universe out of whole cloth, but then putting all the main characters in a mysterious arena where they’re forced to fight to the death in a single-elimination tournament. It’s Marvel Super-Heroes Secret Wars taken to the next level, without the preconceptions about who should win a particular bout. It’s a hell of a hook, which is what made me buy the book in the first place, but the story is the characters trying to figure out who’s capturing them and why they’re being forced to fight (never mind how they’re able to mess with their heads to make even the purest heroes in the arena). With a large cast not every character shines, but many do, especially the unpowered Sable, Mink and Rat, who have been leading the investigation into who’s holding them and why. 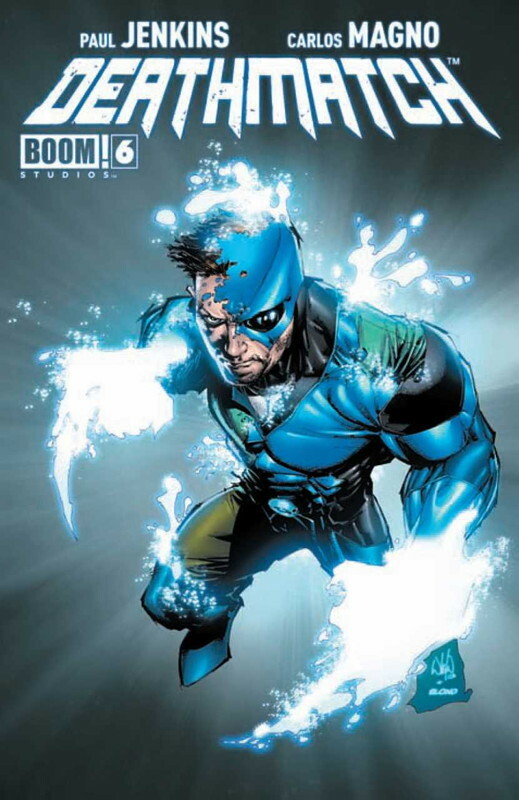 This particular issue occurs just after the character had a chance to look behind the curtain as the complex’s power supply temporarily went down. Some scores were settled, and something awful was glimpsed in battle with Meridian, the book’s Superman equivalent. But the Manchurian realized the danger and reactivated the facility and the games went on. This leads to Dragonfly (a young man who’s retired but has been roped in nonetheless – that’s him on the cover) confronting Meridian, learning another piece of the puzzle in the issue’s cliffhanger. Carlos Magno’s art is terrific. I recall his work as some of the better art in Countdown to Final Crisis (damning with faint praise, since hardly anyone else in that terrible series looked much good at all) He has a Dave Gibbons-like layout style (figures always drawn in freeze frame, with no motion lines) with an inking/rendering style a bit like George Pérez. He draws fully-realized backgrounds, too! I’m not sure how long Deathmatch is slated to run, but 2 more issues or 6 I’m planning to enjoy it entirely.